Learn about the 3 basic levels of defense. Improve your defense and counter-punching against better opponents. 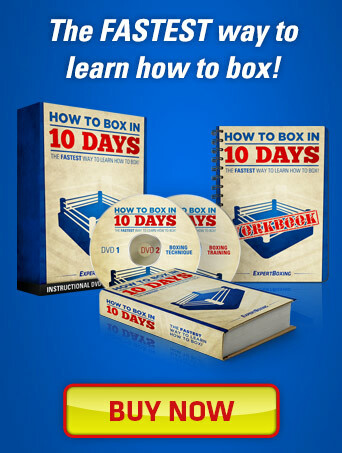 I broke down boxing defense into 3 different levels. The higher levels of defense will offer you a more effective defense as well as more counter-punching opportunities against better opponents. Train them in order and master all three! Easy to do. Requires no skill. Very effective for blocking entire combinations. This defense protects you against any style of opponent. Can block your vision from tricky punches. Not easy to counter-punch from. Can be tiring to hold your hands up all the time. Work focus mitts and have your trainer throw slow punches at you. Work on your stance to make sure you don’t fall over when you’re taking punches. Work on footwork around the heavy bag or in the ring as you hold your hands up high with your elbows down. The counter defense is the next level of defense. Anytime you attack, you should be aware of how your opponent is most likely to counter back against you. If you’re throwing a jab, expect an overhand right. If you’re throwing a right hand, expect a left hook counter. Anytime you throw a punch, you should know what punch your opponent will probably counter with. Allows you to be more offensive with less worry. Improves your counter-punching ability since you know what to expect. Saves energy since you are only worried about blocking specific punches. Will not help you against tricky style opponent. Can make you vulnerable against tricky counter-punches. Requires you to be more alert. Requires you to use your memory or train until your counters become a natural reflex. Work focus mitts with your trainer. Have him throw counter-punches after your combinations. Spar slowly with beginner level boxers and see what kind of punches they like to throw. The awareness defense requires the most skill and elevates your boxing game to a whole other level. At this level of defense, you rely on high awareness inside the ring to defend yourself from your opponent’s attacks. Using high awareness is what allows guys like James Toney or Floyd Mayweather to constantly slip and duck all their opponent’s punches without getting hit. Raising your awareness allows you to feel what your opponent is doing and to evade the punch. Because your awareness is so high, you will be able to defend yourself without actually using the physical guard (Level 1 defense) or having to remember what punches your opponent will throw (Level 2 defense). Allows you to box against higher level opponents. Allows you to defend against trickier opponents. Allows you to see more since you use your eyes for defense. Gives you more offensive and counter-punching opportunities. Will leave you dangerously vulnerable when you are tired or lazy. Requires the most energy, physically and mentally. Work focus mitts with your trainer. Have him try and surprise you with punches during and after your combinations. Work on the double-end bag a lot. Spar with guys of all different types of styles. Work with smaller guys so you don’t get hurt bad while you’re learning how to defend against different styles. you’re so wonderful i’m a boxer and you just help me a lot with your instruction. nice 1, itmay sound silly but im trying to teach my brain to box as well as my body and articles like these really to get the brain thinking. i will come back to this article again. @dan – learning how to use your brain to fight isn’t silly at all. 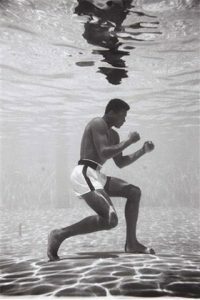 Every great trainer has stressed time and time again–“boxing is a thinking man’s game”. I’m glad I could help. I have just started an mma boxing class which uses a high guard with the forearms and elbows as the primary form of defense. The stance is called hunchback because its designed to ensure the stomach isn’t badly punished. As an expert, what do you think of http://www.crazymonkeyuniverse.com/ ? @Robert – I took a look at the crazymonkeyuniverse site. It looks cool but I couldn’t scope out the information without buying. Either way, if Rodney King got his belt from Rigan Machado, he’s gotta be pretty legit. I have yet to be trained by anyone on that level in boxing. Physical defence against right cross? I keep getting mixed answers for this so please help me. When defending against right cross by raising your hand to cover your face how far do you go, do you cover left side of your face with glove close to your face/chin or raise your hand high enough to take a hit with the side of your elbow/hand area? Glove scenario is ok, but when i got hit few times with semi powerfull cross i felt like i was about to knock myself out with my own hand. 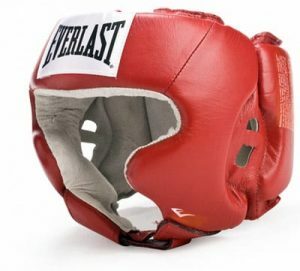 While with elbow/midhand defence move, i feel it offers me more protection and i can take more powerfull hits, but i keep hearing its more used in MMA and should not be used in boxing? What are your thoughts on this? @Paul – great question. Haha, sometimes I feel I don’t know how to block the right either. Some guys throw them awfully hard! There’s literally a million ways to block the right, including the ones you suggested as well as many others. There’s the roll away, where you just raise your glove to cover the side of your forehead as you roll away. There’s also the high block, where you use your upper arm (what you mentioned)…I tell fighters to just “touch your ear”. There’s also an upwards maneuvers where you push your forearm up and INTO the oncoming right hand. MMA guys are more accustomed to the stronger high block that you mentioned because they also use it to block head kicks. Boxers typically prefer to roll the punch than to lift their arms and expose themselves to a body shot. My suggestion is for you to learn all the methods, they will have different uses against different styles. i am involved in boxing here in greece the last 20 years.Your article plus training and talking with a guy who met roger mayweather and roy jones last year make me understand about strategy.I had bad moments like broken ribs and knockouts in training.boxing in greece is brawling nothing else…(example:kaperonis vs amir khan, olympic games 2004, see it in youtube).My son is 7 years old and now i try to teach him defence.started with guard, then parry punches and pivot.I should be more than gratefull if you send me your advice about proper training for a 7 years old kid. Wow, Panos. I saw that video and wow, what an awesome brawl. I will definitely write a guide on how to train kids. Thank you for the suggestion. The biggest tip I can give for training kids is not to teach your fighting style. Teach them skills and techniques and let them fight in many different ways. That last little bit about the awareness defense is so true. I was boxing this kid who has a bit more experience than me, and is training for a fight, and i just kept on countering him because i was aware of what he was throwing, but as soon as i gassed out, all i could do was cover up and try to land a pot shot on him. Great article, definitely on of my favorites! So hard to stay alert when you’re tired! Thanks, Mac! http://www.boxingfitnessfactory.com/Boxing-Training—workout.html what do you think about the defence described on hear about cutting off on the angles? Would it aid my body punching in any way? That’s standard boxing info. I don’t understand how taking away the angles improves your body punching. Great advice! What’s your advice for increasing your reflexes and being able to see a punch comingnatmyoumwhile dodging? Spar slowly and learn to see every little detail in the movement of the punch. Where would mayweathers shoulder roll fall in these categories…also is the shoulder roll the best defense because I never see mayweather get cuts on his face?? The shoulder roll is an awareness defense. There are many kinds of boxing defense techniques and you’ll definitely need to know them all. Mayweather has mastered many, not only the shoulder roll. Start with learning the different types of defensive techniques and defensive strategies. I cover several defensive fighting methods throughout my articles. However this level 1,2 and 3 stuff is false. if trained enough all three of these can reach a higher level of defense than the others. 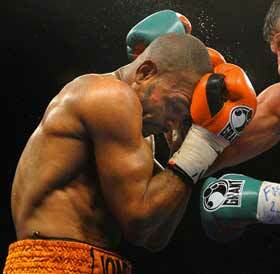 For example Ronald Winky Wright had developed his high guard to a very high level. Some fighters who have a higher level of awareness like Roy Jones Jr have been defeated and knocked out cold because of a lack of solid fundemental boxing technique.